It's not hard to image this scenario: you create a custom view, everything is just the way you like it. Then you accidentally sort by a different column. Outlook saves the changes and your perfect view is ruined. In the early versions of Outlook, users were presented with a "Do you want to save changes?" dialog, however, this dialog was confusing and annoying. Later versions saved changes to view automatically and the scenario above was all too common. You can use a VBA macro to prevent changes from being saved – you can still sort the columns and change the view, but when you leave the folder and return, the original layout of the custom view is restored. This VBA sample code will prevent changes from being saved to the views. You can use an If statement to lock only views available to Everyone, or lock all views. If you need to make a change to the view, you'll need to unlock it by changing Call LockView(objView, True) to Call LockView(objView, False). The macro as, written, locks the view on the default Inbox: Set objViews = objName.GetDefaultFolder(olFolderInbox).Views. You'll need to change the folder to apply it to other folders. After adding the view to the VBA Editor, click in it then click Run or press F8 key. This will lock the views. You do not need to add a button to the ribbon or toolbar or run it frequently. However, if you need to edit a view, you'll need to unlock the views (by changing True to False) to make the changes then re-lock it. Macros to lock and unlock "All [Folder type]" views on selected folder and subfolders is in this text file: lock-unlock-views.txt. To use, paste the macros in a module then click in the LocksAllViews or UnlocksAllViews macro and click Run. 'all users of this folder. The line If objView.SaveOption = olViewSaveOptionThisFolderEveryone Then determines which views are locked. In this example, only the views created for This Folder are locked. 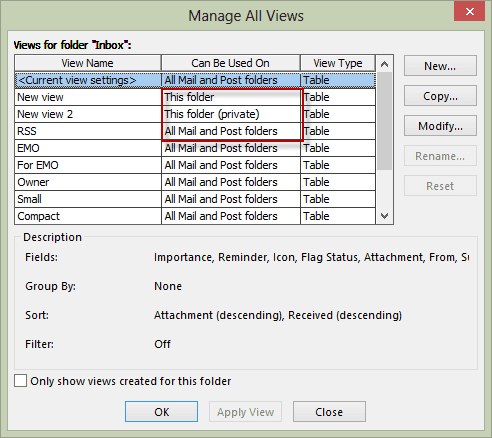 This can be changed to lock views available in all folders (of the item type) or lock private views. To check your macro security in Outlook 2010 or 2013, go to File, Options, Trust Center and open Trust Center Settings, and change the Macro Settings. In Outlook 2007, it’s at Tools, Macro Security. Sorry.. I tried second time and it works like charm !! Yeah, sometimes it doesn't seem to work the first time. Great VBA Diane.. Thanks a lot. I want to lock views of a Search Folder; macro seems not be working on it. As long as it's an 'all users all folders' view, it should work on any folder.